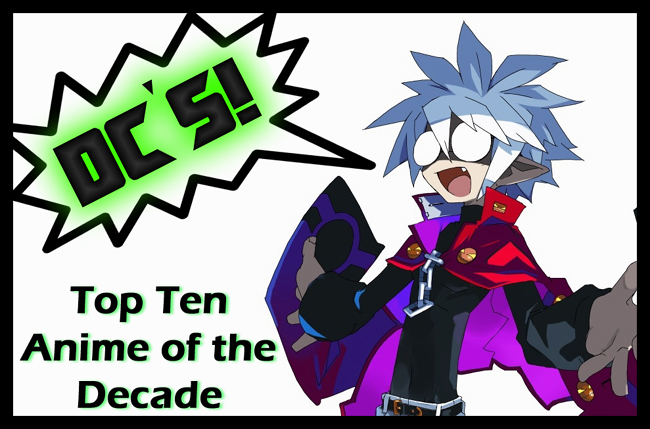 Yeah, yeah, yeah, I know you are all probably sick and tired of all the top ten lists by now, but hopefully there is enough variety between the different editors to keep you blissfully amused… Besides, a decade only ends once every ten years. It’s special. It should be noted that I’m not picking seasons, I can’t, because to me they are all part of a greater work. Also my list would look a little redundant with 3 Full Metal Panic series, 2 Ghost in the Shell series, and 2 Black Lagoons series. I’m gonna try and keep it short and sweet, so here it goes. Death Note – Brilliantly suspenseful. If I didn’t hate Light so much (to the point of the show being unwatchable) it might have made it into the top ten. Claymore – If not for the rushed, patched together ending, this show could have been a classic. Girls Bravo – Jiggly, funny fan service at it’s best. Dears – After multiple viewings, this show still makes me laugh uncontrollably every single time. I wish there was more of it. Elfen Lied – Freaky, scary stuff… barely misses the top ten. Karin – My favorite Vampire ever. I just wish the story around her was a bit more solid. 10 – One Piece – Started at the very tail end of 1999 and it’s ran for 10 years so I’m counting it. This show is just fun, plain and simple. Unique art design, funny yet enduring characters, and high adventure on the seven seas. What is not to love? 9 – Ai Yori Aoshi – I don’t know if I personally have ever seen a more compelling story of love in an anime. Mix in a little bit of drama with a little bit of comedy and throw in just a dash of fan service and you get the perfect recipe for an amazing series. 8 – Beck – I’m not musically inclined… at all. Yet this show made me want to learn to play guitar. That’s saying something. 7 – Higurashi no Naku Koro ni – There is something about a harem comedy with strange plot twists, time warps and gruesome murders that appeals to me. 6 – Gurren Lagaan – A refreshing new take on some tired old genres like Big Mech and Post Apocalyptic Sci Fi. This show has a cast of characters that will make you stand up and cheer, not to mention it probably has one of the biggest plot twists I have ever seen in an anime. It will catch first time viewers off guard and quite possibly make them cry. 5 – The Melancholy of Haruhi Suzumiya – Say what you want about the 2nd season… I have still yet to finish it, but there is no denying the wonderful appeal and uniqueness of the first season. Despite the recent criticism, this show was a grand cultural phenomenon for a reason. 4 – Fullmetal Alchemist – I have never seen a show that was so diverse in it’s elements (pun intended) that it could bring up an equally diverse set of emotions within me. It wasn’t uncommon for this show to have me laughing one minute and on the verge of tears the next. There were episodes that uplifted my spirits and others that had me joking this show should have been named “Fullmetal Grave of the Fireflies.” This show was simply brilliant all around. 3 – Black Lagoon – Best pure action show… ever. 2 – Full Metal Panic – I dunno if I can describe the intense love I have for all things Full Metal Panic. I watched the show on a whim one day via a Netflix rental, expecting just another Big Mech anime. It wasn’t and I was instantly hooked. Hooked is putting it mildly as, after I watched that first disc, I bought every single dvd I could find over the course of the next few days. Full Metal Panic is NOT an anime about big mechs despite what the front cover of the original ADV DVD packaging would have you believe, it’s an anime about people, relationships, war, and peace. It’s full of edge of your seat action, inspiring drama, and sidesplitting humor. This is the perfect anime to me. 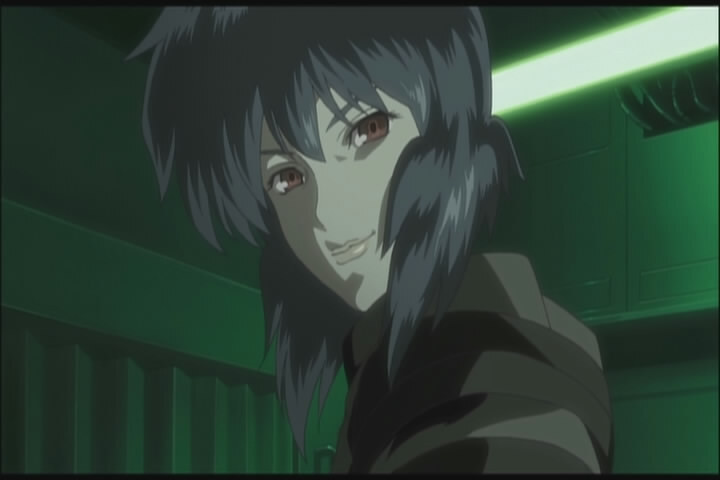 1 – Ghost in the Shell SAC – I had a very tough time deciding which anime would be #1 and which would be #2 on this top ten. Ultimately, SAC won because in my opinion, it takes a classic, one of the pillars of modern anime and makes it better. The style, the music, the characters, the animation, everything about this show is simply stellar. It doesn’t get better than this for me. Stay tuned for a new “Adventures in Blogosphere” coming this weekend, where I will tackle Haruhi Suzumiya. Well… not actually tackle her… you know what I mean! Get your minds out of the gutters you filthy pervs! Geez… the nerve of some people. TMoHS would have been in my top 10 too but I’m still pissed off at what they did with the 2nd season. I have to recommend Ouran H.S. Host Club(a shoujo I liked) and Baccano! to you. Gosh, Ai Yori Aoshi…That was something I loved, yes loved, for a long time. It was a love story done right with interesting harem stuff to tickle my fancy. I really like Chika-chan but I always rooted for Aoi. Can’t believe I forgot about this one completely. Very very solid list. Better than a lot I’ve seen. Glad to see a solid list for once. I liked all of the anime on this list that I’ve seen. This is another post that makes me realize that I really should think about starting Gurren Lagaan. Frog – While Haruhi’s 2nd season was lackluster, it doesn’t make the first any less brilliant. Also I’ve seen the first few episodes of Ouran and I like it, but I haven’t finished the series yet. Baccano I’ve been meaning to watch for a while now too. Gio – Thank you! I’m glad you like the list. Yes, do watch Gurren Lagann. It is simply awesome, you won’t regret it. Totally agree with SAC taking the top spot. It’s rare to see such a class act work out as well as that does. You know, I totally love Dears. I never mention it because I use to know so many people that hated it and called it a Chobits ripoff. Didn’t stop me from getting merch and the totally awesome soundtrack. I must have seen the anime 5 times and I have all of the manga. I liked Karin too, but there was something rushed and dull about the ending. Kinda made me stop reading the manga. And I really loved Beck. It was one of the few shows at the time that I could show some of my more open-minded friends that weren’t really into anime. Cirno – Those people are wrong. Dears is awesome. I like it so much more than Chobits. I wish the story in Karin was a bit more solid. Definitely missing a mention to Shakugan no Shana. On a purely personal point of view, it’s also missing nods to Dokuro-Chan and Busou Renkin. But I’m fine with FMP being where it is! Thanks for remembering Elfen Lied and DearS, such masterpieces. Not a bad list, seems to be sticking to the mainstream like superglue though. A few i’d have put in would be Claymore (In your honourable mentions), Hajime no ippo and possibly the short series called Eden of the East, which had an amazing plot idea, moments of great humour, tension, mystery and more, but in the end it was still too short. So maybe i’d just leave that one out. TMoHS Is great, you’ll never find another girl like Haruhi! Denpanosekai – I never saw Shana all the way through unfortunately. That second or third episode where everyone forgot that girl classmate broke my heart. (Yes, I know I’m a big softy). Thanks for commenting!